This is my grandmother’s percolator. Before our K-Cups, corner Starbucks and coffeemakers, this was how you got your cuppa joe. I have no idea how old it is. I’m now brewing my second pot of coffee in it. I know est ist mitternacht. 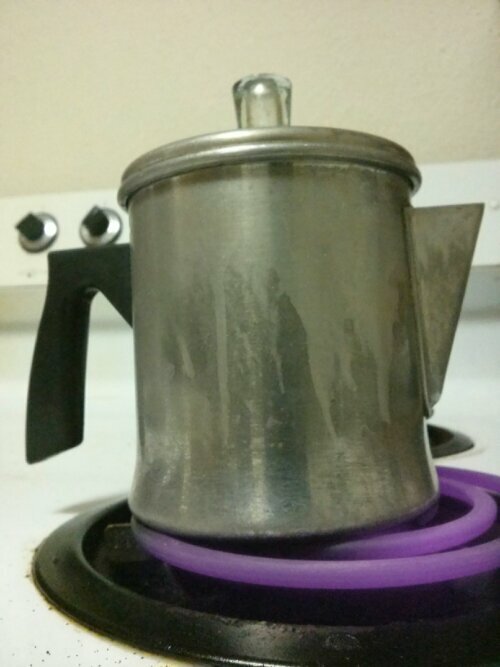 My mom doesn’t do coffee so this was just sitting on the stove. I have many memories of grandma’s pot bubbling as she made her mornning brew. Typically, she drank it out of a bone china teacup. I don’t know why. That cup is in my cabinet. The coffee is delicious. I don’t know whether it’s nostalgia, the old metal, the brown sugar I’ve been using lately or the stains of a thousand brews that will never come off the inside. It’s delicious. I’ll take good care of your coffee pot, Grandma. Aside: I have a stovetop percolator, a manual typewriter from the ’30s and I dress like Mr. Belvidere. Next stop: penny-farthing? At some point, I stopped marking this day. I know I had a good reason when I stopped but I felt it prudent to bring it up today. I’m actually cheating a little, as I’m writing this the night of March 11-12. But whatever. As I’ve said numerous times before March 13 has been a major date in my life for several reasons. Growing up, I always confused March and May. Theresa’s birthday is May 13. I would always say it was March 13. My younger nephew, her child, was born March 13. I began my journalism career seven years ago on March 13. I inadvertently counted down to Grandma Elliott’s funeral five years ago, which was also the day I changed my name to Elliott in honor of her and my grandfather George. I’ll never forget getting back in the limo after the graveside service and immediately being handed the signed court order making her surname my first name. It all seemed to come together as, whether she knew it or not, she’s the reason why I’m a journalist. When I’m at my laptop, I can look to my left and see a photo of her. It’s the one that fell down in this post. It’s been seven years, SEVEN YEARS since I began being a journalist for real money (but, since I’m a journalist, it’s not “real money”). It’s been seven years since an impromptu trip to Florida ended with my first day of work. Seven years since we stopped, on our way to Florida, at Oaklawn Boulevard in Hopewell and I had no idea how right I was when I announced that exit soon being my where I went home. Despite everything, in some way, that is going to be a home of sorts. So much has happened in those seven years. It’s hard to believe I was some 22-year-old technically still in college and technically in my 23rd year. Becoming an adult was so much trial and error. Mostly error. Seven years ago, I was a wide-eyed, freshly minted reporter wondering if I made a horrible mistake in becoming a journalist. Seven years later, the hierarchy in a newsroom is Managing Editor > City Editor (when we’re working at the same time) > Me > Reporters. Some days, technically, the hierarchy is Me > Reporters. And this is after three years of somehow keeping a twice- and then thrice-weekly newspaper afloat. I swear, I’ve seen more in seven years than some people in 17. That explains all the grey hairs sprouting all over the place. It takes more than that to stop me. I persevered through it all and wouldn’t have anything that happened happen any other way.